Italian cinema has always been very stylish, with the likes of Federico Fellini delivering rich and memorable tales filled with Roman class. The Great Beauty continues that tradition. It’s a great-looking and soulful film that shines a light on the superficial elitist culture in modern Rome. We meet journalist Jep Gambardella (Toni Servillo) on his 65th birthday, the moment he realises he’s now in the twilight of his life. He makes a few radical changes after concluding his lifestyle over the last forty or so years has been vacuous. We follow him as he lives his life, casting a critical eye on the bourgeoisie world he inhabits. Paolo Sorrentino’s film sparkles like a glass of fine Prosecco, with lush visuals and gorgeous camera work showing Rome at its best. However, the film has real depth too. Servillo delivers a great performance as the aging lothario who tries to right a lifetime of emotional wrongs. It’s a nuanced part that is at once witty, heartfelt and charismatic. It’s easy to see why Sorrentino’s film has received so much awards traction (including BAFTA and Academy Awards nominations for best foreign film) – it’s the type of film that non-Italians love to watch. It makes the decadent lifestyle look so appealing. In a way, The Great Beauty is supposed to be critical of our lead’s life – and he openly mocks it throughout the film– but that doesn’t stop him from enjoying his privileged position. Presumably in an alternate universe I’d be writing that the film was unrealistic- if he’d given it all up – not that The Great Beauty thrives on realism (a few party moments are super-stylised). The Great Beauty is close to perfection. At 2 hours and 20 minutes, it’s a little long and it could have done with a trim in the editing room to maximise its appeal. That’s not a major criticism, but I feel a little bit of the sparkle drops out in the last act. This is a shame because everything that came before it felt so vibrant. It’s not enough to ruin the movie, but it I feel like Sorrentino lost a little bit of focus. There’s a wealth of great foreign films out there and The Great Beauty is one of them. It’s well worth your time and its plaudits on the awards circuit are well earned. Recommended. 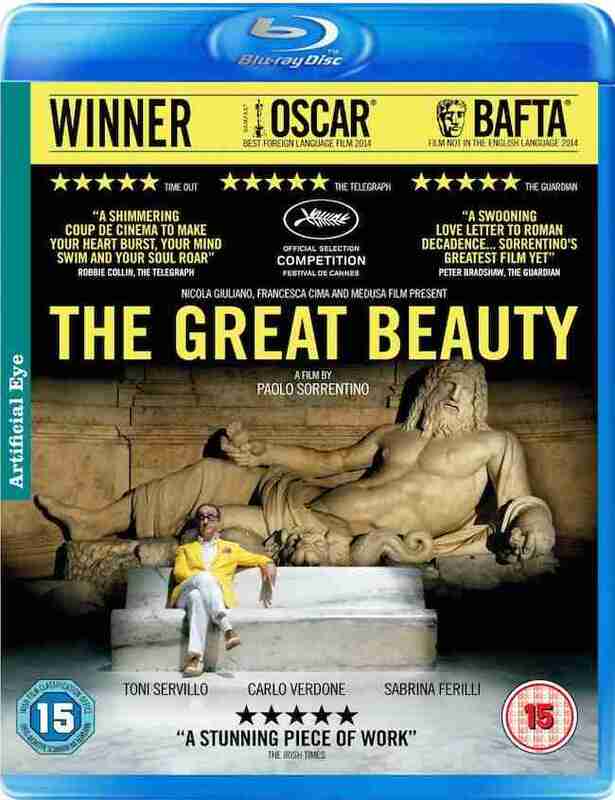 The Great Beauty disc comes with a 15 minute behind the scenes look at the film. It’s an interesting piece which illustrates how director Paolo Sorrentino achieved his vision.